Sometimes you just need to switch things up and gain a new perspective. 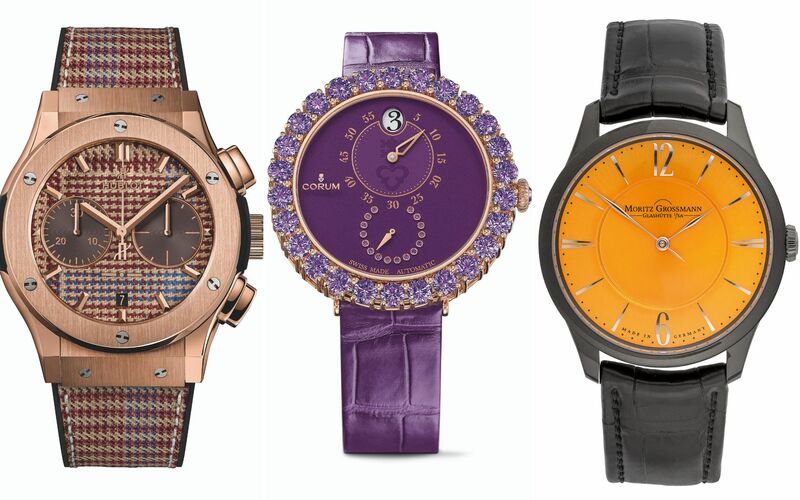 For the times when you feel that black, white or silver dial is too pedestrian, these watches come in unusual hues designed to make your day bright and pretty. An entirely new collection for women, Corum’s Eleganza boasts a regulator movement with three separate time indications. There is the jumping hour, displayed via an aperture at ‘12’, the minute counter below it, and the seconds counter at ‘6’. It comes in a variety of colours but this bold purple dial with pink gold case wins our hearts for its audacious combination. It is appropriately matched with a bezel embellished with 27 amethysts, with another 16 on the seconds counter. With the recent renewal of its partnership with Bentley, Breitling has made the decision to integrate the Bentley editions into its core product, starting with the Premier B01 Chronograph 42 Bentley British Racing Green. The Swiss watchmaker has interpreted the British racing green beautifully on the dial, aptly matched with a leather strap in similar sporty hue. The Tudor Style is distinguished by its retro design codes from between the 1950s and the 1970s such as the fluted bezel and baton hands. The choice of gold champagne for the dial only reiterates the ostentation of the period. With its perfectly round case, well-proportioned lugs, asymmetric dial with outsize date apertures and manual calibre L121.1 with twin mainspring barrel, the Lange 1 is a classic A. Lange & Sohne. What sets it apart, however, is this unexpected shade of purple on a guilloched gold dial with matching alligator leather strap. Created to celebrate the independent watchmaker’s 10th anniversary, Moritz Grossmann’s Tefnut Pure High Art definitely pops for its canary yellow dial, a stark contrast against the polished rhodium indexes and hands as well as the blackened stainless steel case. A unique piece, it is powered by a manual movement with elaborate finishing that includes wide Glashütte stripes and hand-tempered screws in brown-violet. Hublot collaborated with Italian stylemaker Lapo Elkann on this special edition Classic Fusion Chronograph Italia Independent. Elkann turned to the archive of Italian tailor Rubinacci for inspiration and one of the most outstanding fabrics picked is this Prince of Wales check in brown with blue accents that has been fashioned into the dial and strap. For such a noble material, only Hublot’s King Gold is worthy for the case.